Sensas 3000 Lake is Sensas most popular and versatile mix. Full of attractors that work constantly in your swim to keep all species interested. The base to many of Team England's successful mixes. Sensas 3000 Fine Lake has the same successful formula as Natural Lake but ground more finely. Ideal when you need to attract the fish but do not want to overfeed them. Sensas 3000 Black Lake is full of attractors that work constantly in your swim to keep all species interested. Perfect for clear waters and difficult conditions especially in winter. Sensas 3000 Red Lake is great during the summer months, particularly good for Skimmers when your looking for those live baits. Sensas 3000 Magic Natural is an old favourite and still one of the best, this sweet mix is great for Skimmers and Bream. Sensas 3000 Magic Black is a winter mix, fine, black and full of sweet active ingredients. Sensas 3000 Magic Red is sweet mix great for skimmers and bream, a popular summer mix. Sensas 3000 Magic Red is ideal for coloured waters. Its sweetness makes it a perfect bream and skimmer mix, both for feeder fishing or balling. Sensas 3000 River is another popular mix. Can be mixed heavy to go straight to the bottom of fast rivers. Full of feed, with medium sized particles. Sensas 3000 Black River is another popular mix. Can be mixed heavy to go straight to the bottom of fast rivers. Full of feed, with medium sized particles, idea in clearer water, Black River gives fish confidence to feed. Sensas 3000 Explosive Feeder is one of our finest, active, high in feed, full of crushed hemp and other fish-catching ingredients. Sensas 3000 Feeder Grountbait is a special mix is designed to disperse quickly from the feeder, giving a cloud of fish-attracting particles. Sensas 3000 Formula Supreme is a light, fluffy and open texture this groundbait is ideal for fishing ‘on the drop’ when fish are feeding off the bottom. Having very little feed content it’s a great small fish bait when the need is not to overfeed. Adding a few handfuls of Match Blend will increase the food content and stiffen the mix for deeper waters. Sensas 3000 Match Blend is a special dark aromatic formula is an excellent base mix for the match angler who needs a quick response. Within minutes the bait will form a carpet feed of active particles pulling fish from a large area. Adding a few handfuls of Formula Supreme with lighten the mix when fish are more active and taking baits ‘on the drop’. Sensas 3000 Ton Up says exactly what is does on the bag, Ton Up has accounted for numerous lots of 100lb Bream catches in both Ireland and the UK to its credit. This versatile groundbait can be mixed into a heavy texture to feed by catapult and by hand or a little dryer, perfect for the feeder. With its orange colour, Brasem flavouring and added coloured particles it will attract Bream and big fish from a distance and hold them in your swim for hours. 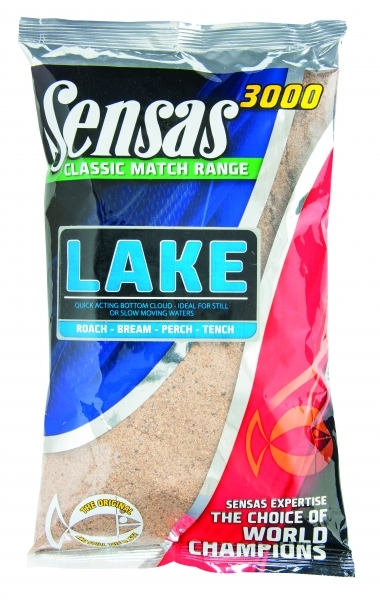 Sensas Classic Range of Ground Baits are perfect mix to attract Perch, Roach, Bream & Tench into your swim.